Highly portable, powerful aerial system for the demanding filmmaker. The S900’s arms and landing gear are made of sturdy carbon fiber, greatly reducing weight while increasing stability and strength. This enables a long flight time without sacrificing performance. With arms that fold in to save space, the S900 is built to be taken wherever you need to go. Then when you want to fly, it can be ready to go in just a few minutes. Never before has a professional hexacoptor been so portable and easy to transport. The upper center board can be removed, allowing easy access to install your flight controller and IMU, and giving you a convenient way to setup the power distribution system. Even installation of your main controller, iOSD, Lightbridge, or any other accessories is faster and easier than ever before. This new center board structure is perfectly compatible with the DJI WKM and A2 flight controllers. A redesigned, rebuilt power distribution system improves safety and reliability. Gold-plated metal bearings with a unique screw design secure the power cords, ensuring cables will not come loose during flight and allowing easy setup. Prevent short circuits and easily plug in your power supply with the AS150 sparkproof plug. Weighing just 3.3kg, the S900 has a maximum takeoff weight of 8.2kg. This means you can easily carry most cameras and gimbals. Used with a 6S 12000mAh battery, it can fly for up to 18 minutes*. *Maximum flight time is tested on a breezeless day with a payload of 6.8kg, hovering at a height of 2 meters. 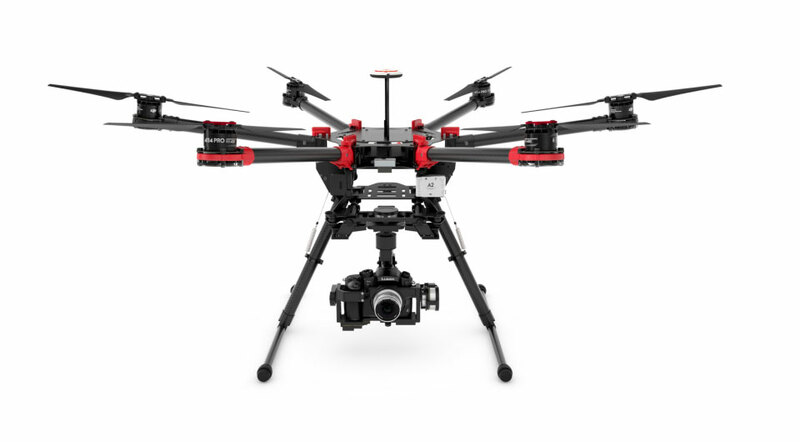 Retractable landing gear and a special low gimbal mounting bracket gives you an extremely wide range of possible shooting angles and camera motions. DJI’s Zenmuse camera gimbals are known for their stability, providing smooth footage capture in even the most difficult of conditions. The S900 fully supports the Zenmuse Z15, GH3, GH4, and BMPCC gimbals. The S900’s gimbal bracket is separated from the main frame by specifically designed dampers. This significantly reduces high-frequency vibrations and makes your shots clearer and sharper. A 40A electronic speed controller (ESC), our fastest available, is built in to each arm. The 4114 pro motors, high performance 1552 folding propellers, and V-type mixer design combine to give each arm of the S900 a maximum thrust of 2.5Kg. Our latest motor adopts a single wire stator design, offering improved heat dissipation, better performance, and a tidier, more reliable system. Each arm is designed with an 8° inversion and a 3° inclination, making the aircraft more stable when rolling and pitching, yet more flexible when rotating.